As a nation, we’re fascinated with the concept of miraculous healing. Presumably, this miracle can come in the form of a pill, tea or a fantastically labeled elixir of health. Every day, millions of dollars are spent as people search for cures in the form of mystical pharmaceutical remedies that can banish all ailments and protect from disease. Sadly, no one ever finds it. It seems that fancy packaging and slick marketing aren’t directly proportional to healing abilities. At best, these mass-produced, semi-synthetic, meticulously labeled products have but a minor placebo effect. At worst, they can actually make our health decrease, unbalance hormones and offset vital bodily functions. It may come as a surprise to learn the mystical health tonic you’ve been searching for is much closer to home. As with many things in the health world, taking a step back and observing how our predecessors did things can be invaluable. The solution lies in simple, minimally processed, raw ingredients — ones that are selected for their natural health benefits, not as a small cog in a great machine comprised of many altered, unnatural ingredients. Here are two three-ingredient concoctions that may just provide that miracle of health and healing you’ve been searching for. While very simple to make and with no rare or hard-to-find ingredients, this health tonic is wide-ranging in the benefits it bestows upon those who drink it. It can relieve constipation, reduce inflammation, support kidney function, promote heart health, prevent or fight urinary tract infections, protect against bacterial, fungal or viral attack and keep the common cold at bay. As you can see, it is a heavy-hitter in the realm of health care, helping to boost your immune system and support strong heart and organ function. The key to success with this health tonic is to source only the highest quality ingredients. Now is not the time to worry about your wallet at the supermarket or health-food store. It’s absolutely a worthwhile health investment to buy high-caliber ingredients. The apple cider vinegar must be raw and organic. Raw means it still contains the active cultures that support your gut biome and bolster your immune system. Organic means the apples from which it was made are not coated in pesticides, heavy metals and toxins, which would then pass into your system and offset all your hard work. The honey must be raw, preferably organic. Organic just implies the bees have not pollinated flowers or plants which are treated with pesticides, herbicides or other nasty applications. This ensures you get only the highest quality honey from known sources. Raw means that the honey has not been pasteurized, a process to increase its shelf life but can render it biologically inactive by killing off the active enzymes in the honey — the reason it’s such a potent ingredient. And of course, your cinnamon should also be organic. As with our other ingredients, buying non-organic cinnamon means you’re at greater risk of ingesting harmful toxins and heavy metals, which can negatively impact your health. Combine two cups of the apple cider vinegar, one cup of honey and two teaspoons of cinnamon in a jar and stir/shake well. Store your super syrup in a cool dry area, keeping in mind that placing it in the fridge will cause the honey to harden and settle to the bottom. A couple of sips in the morning, and again at night are enough to ensure you enjoy all of the nurturing benefits of this tonic. That’s right, we’re once again employing the health properties of our friend apple cider vinegar — it’s just that good! This time it’s a simple concoction you can make in seconds if you have the ingredients ready; all you need is some warm or room temperature filtered or mineral water, raw organic apple cider vinegar and half an organic lemon. Simple as that. Drinking this each morning, as soon as you wake up and before you put anything else in your stomach, is an excellent way to start your day. It stimulates digestion, expels toxins from the liver and supports your digestive enzymes for a busy day ahead. Once again, the ingredient requirements are strict: your water should preferably be spring water from glass bottles, but if this isn’t available then filtered water will do. This ensures the base for your tonic isn’t introducing new toxins into your body as you drink it — that would be a bit counterproductive. Next, as above, your apple cider vinegar should be raw, organic and unfiltered. When apple cider vinegar is filtered, the health-giving SCOBY or “mother” (an accumulation of beneficial bacteria and yeast that turns the apples into vinegar) is removed, and we definitely don’t want that. Finally, the lemon should be organic, to ensure its skin isn’t riddled with nasty pesticides and other harmful chemicals. Fill a glass with warm water, squeeze in half a lemon, and pour in a rough teaspoon of apple cider vinegar. Sip it slowly and let it work its magic! These health tonics work best if you keep at it — make sure you drink them as directed for at least a week to begin experiencing the myriad of health benefits they offer. Click Here to get your $1 Detox while supplies last! 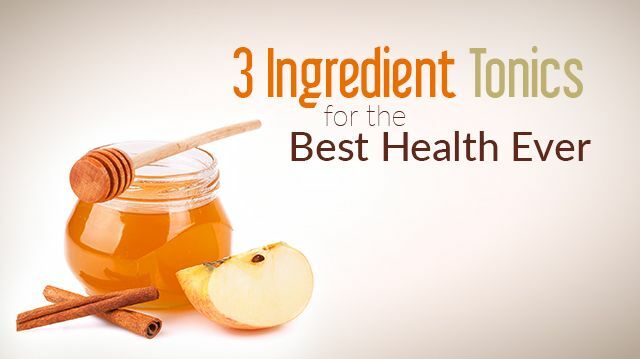 Hey Buddy!, I found this information for you: "3 Ingredient Tonics For The Best Health Ever". Here is the website link: https://www.thealternativedaily.com/tonics-for-best-health/. Thank you.